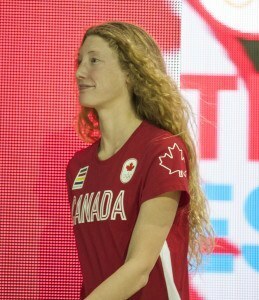 Interview avec la canadienne Penny Oleksiak aux Championnats du monde juniors d’Indianapolis. 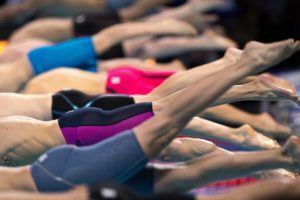 The sixth and final day of the 2017 FINA World Junior Swimming Championships gets underway this morning from Indianapolis. With the meet concluding tonight, there will be no races with semi-finals (50s and 100s) contested this morning. 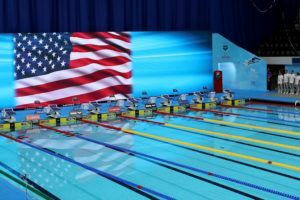 There will be four different 200s: the men’s 200 back, women’s 200 breast, men’s 200 fly and women’s 200 free, followed by men’s and women’s medley relays, and it will wrap with the early heats of the men’s 1500 free. The top seeded heat will swim with finals. American Carson Foster cracked the 2:00 barrier from the first of three circle-seeded heats, clocking 1:59.44 to clear Ireland’s Conor Ferguson (2:01.56) by over two seconds. When all was said and done, Foster would lead the field into the final while Ferguson advances in 8th position. Tomas Ludvik of the Czech Republic won heat 5 in 2:00.09 over Romania’s Daniel Martin (2:00.64) and Great Britain’s Brodie Williams (2:00.81), which put them 2nd, 3rd and 4th overall with one heat to go. 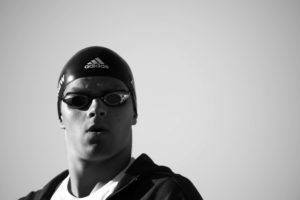 Heat 6 produced three of the top-5 qualifiers, led by 100 back gold medalist Hugo Gonzalez of Spain in 2:00.13. He was followed by Russia’s Nikita Tretyakov (2:00.21) and Great Britain’s Elliot Clogg (2:00.48). They end up qualifying for the final 3rd, 4th and 5th overall. American Kieran Smith ended up finishing 11th in 2:02.72. 100m gold medalist Mona McSharry got things going in the first circle-seeded heat of the women’s 200 breast, touching first in a time of 2:30.07 with Canadian Faith Knelson 2nd in 2:31.35. 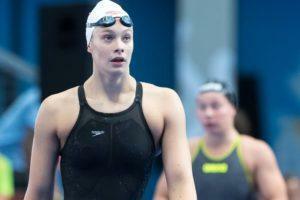 The next two heats were both faster, as Great Britain’s Amy Bell (2:29.20) topped American Ella Nelson (2:29.44) in heat 5 and then Nelson’s teammate Zoe Bartel took over the top time in the last heat in 2:29.00. Annabel Guye-Johnson of Great Britain took 2nd to Bartel in the last heat in 2:30.06 to sneak by McSharry’s time, and Tereza Muselova of the Czech Republic was also fast enough to advance to the final in 2:30.77. McSharry ended up 5th, with Knelson 7th and Sweden’s Hannah Brunzell rounding out the finalists in 2:31.36, with Spain’s Laia Marti Fernandez (2:31.47) on the outside looking in. Junior world record holder Kristof Milak of Hungary cruised his way to the win in the sixth and final heat of the men’s 200 fly, posting the top time of the morning in 1:56.91. Milak set that record at 1:53.79 earlier in the summer at the European Junior Championships, and will look to challenge both it and the time set by fellow junior Nao Horomura (1:53.90) at the World University Games last week. Yuya Sakamoto of Japan won the first circle-seeded heat in 1:58.18, which puts him 2nd overall behind Milak, and Bulgaria’s Antani Ivanov won heat 5 in a tight battle with Ukraine’s Denys Kesyl, 1:58.74 to 1:58.77. American Andrew Koustik took 2nd in the final heat and qualifies 3rd overall in 1:58.66, and his teammate Nicolas Albiero also qualified in 7th in a time of 1:59.29 from heat 5. Great Britain’s Jacob Peters and Spain’s Francisco Chacon Mateos round out the eight finalists, with Chacon Mateos’ 2:00.10 just getting by 9th place finisher Petr Zhikharev of Russia (2:00.18). Canada’s Rebecca Smith controlled heat 7 of 9 early, but it was Germany’s Isabel Gose who charged home in 29.89 to win the heat in 1:59.65. Russia’s Anastasia Kirpichnikova went two minutes exactly for second, and Smith ended up 3rd in 2:00.66. Taylor Ruck then held off Korean Easop Lee to win heat 8 in 2:00.29 to Lee’s 2:00.61, which put them 3rd and 4th with one heat left. Ruck is the defending champion and meet record holder in the event. Irina Krivonogova (1:58.74) and Ajna Kesely (1:59.70) cracked 2:00 from the last heat, putting them 1st and 3rd overall. Barbora Seemanova of the Czech Republic managed to hold off Hungary’s Janka Juhasz, 2:00.92 to 2:00.95, for the last spot in the final. Gose ends up moving on in 2nd, with Kirpichnikova 4th and Smith 7th from heat 1. Ruck and Lee sit 5th and 6th. 100 free champion Freya Anderson ended up 11th in 2:01.22. The Italian men stormed their way to the win in the first heat of the medley relay in 3:39.04, a time that would ultimately stand up as the fastest of the morning. They had strong splits all around from Thomas Ceccon (55.75), Alessandro Pinzuti (1:00.15), Alberto Razzetti (53.60) and Davide Nardini (49.54). They’ll be further enhanced tonight with WJR holder Nicolo Martinenghi coming in on breaststroke. The United States then won heat 2 in 3:40.88, including the 2nd fastest fly split in the field from Cody Bybee (53.23). They’ll have many options for substitution tonight, including Drew Kibler, Nicolas Albiero, Reece Whitley, Michael Andrew and Matthew Willenbring. The final heat was won by Poland in 3:41.39, who had the top backstroke split from Kacper Stokowski (55.44). Australia and Russia were right behind them in 3:41.43 and 3:41.60, good for 4th and 5th overall, and France qualifies 6th in 3:42.91. 15-year-old Andrei Minakov had the top fly split for Russia in 53.10, and Maxime Grousset was the fastest freestyler of the bunch for France in 49.16. Japan and Brazil round out the finalists, with Germany less than a tenth back of the Brazilians in 9th. 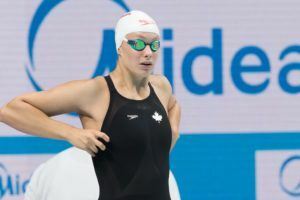 The Canadian women cruised to the heat 2 win in the 400 medley relay, posting a time of 4:03.14 to come just over two seconds off the junior world record which will be at risk tonight. Jade Hannah had the second fastest backstroke split in the field at 1:00.79, and then Faith Knelson (1:08.87), Penny Oleksiak (58.83) and Kayla Sanchez (54.65) had the top splits in the field on their respective legs to take the top time by nearly four seconds. They’ll have many potential combinations for the relay tonight. Taylor Ruck will come in on either backstroke or freestyle, and Rebecca Smith could also be added on either fly or free, possibly moving Oleksiak to freestyle. The U.S. pulled out the victory from the 3rd and final heat, with Alex Walsh anchoring in 55.30 to push them past Great Britain. The Americans clocked 4:06.99 for 2nd overall, with Great Britain 3rd in 4:07.33 and the Russians 5th in 4:08.07. Team Japan, with the top backstroke split from Natsumi Sakai (1:00.32), qualified 4th from heat 2 in 4:07.70. Australia, Italy and Turkey also qualified for the final, leaving the Spaniards and South Africans on the outside looking in. In the 2nd of three early heats in the men’s 1500 Enzo Kihara of Brazil out-sprinted Mexico’s Axxel Salgado Salinas to win the heat in 15:52.21 to 15:52.31, as they sat 1-2 with one more heat left in the morning. In that heat it was Australia’s Jacob Vincent and Japan’s Tatsuki Shoike out ahead of the field, with Vincent starting to pull away around the 1050m mark. He went on to win the heat in 15:18.84, with Shoike 2nd in 15:26.01 and Croatia’s Marin Mogic 3rd in 15:32.59. Kihara and Salgado Salinas’ times stand up as 6th and 7th best as we head into the top seeded heat tonight. That heat features three men seeded sub-15:10, led by Russia’s Iaroslav Potapov (15:00.99). No post on latest medal tally? 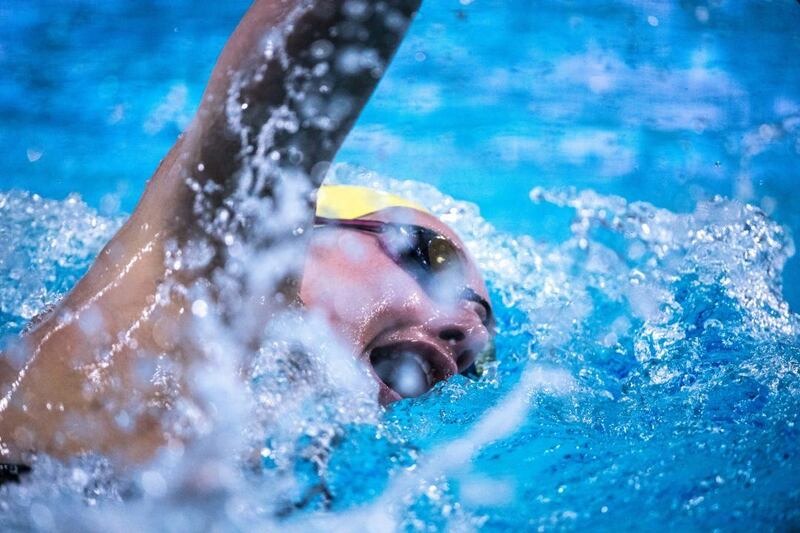 Anderson’s 200fr really interests me – Her 100 is far stronger than either her 50/200. Her PBs 25.4/53.8/2.00.4/4.14 don’t really add up. Sprint stroke efficiency must be awesome. The way she splits her 100 suggests she will be a great 200 swimmer once she has a bit more confidence. Looking forward to it! If she is 6’2″ , its an awful lot to drag through 400mtrs. At one time a 4 .14 early season for f sprinters would be enough to declare to coaches that they’d finished their endurance work & ‘don’t even think about writing that stuff up on the board next to my name’ .